• The front airbags are designed to deploy during certain frontal or front-angular collisions, impacts, or decelerations, depending on the crash severity, angle, speed and object impacted. The airbags may also deploy in certain non-frontal collisions where rapid deceleration occurs. • The SRS sensors, which trigger the front airbags, are designed to react to both the impact of the collision and the inertial forces generated by it, and to determine if the intensity of the collision is sufficient for the seat belt pretensioners and/or airbags to be deployed. However, not all frontal collisions activate the front airbags. • If the collision involves a nonrigid object (e.g., a snow drift or bush), or a rigid, fixed object at a low speed, the front airbags will not necessarily deploy. • Front airbags do not normally deploy in a side impact collision, in a collision from the rear or in a rollover situation. • The amount of damage to the bodywork does not reliably indicate if the airbags should have deployed or not. • Deployment of front airbags occurs only one time during an accident. In a collision where deployment occurs, the airbags and seat belt pretensioners activate. Some noise occurs and a small amount of powder is released. The release of the powder may appear as smoke-like matter. This is a normal characteristic and does not indicate fire. 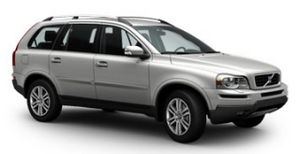 • Volvo's front airbags use special sensors that are integrated with the front seat buckles. The point at which the airbag deploys is determined by whether or not the seat belt is being used, as well as the severity of the collision. • Collisions can occur where only one of the airbags deploys. If the impact is less severe, but severe enough to present a clear injury risk, the airbags are triggered at partial capacity. If the impact is more severe, the airbags are triggered at full capacity. • Do not use child safety seats or child booster cushions/backrests in the front passenger's seat. We also recommend that occupants under 4 feet 7 inches (140 cm) in height who have outgrown these devices sit in the rear seat with the seat belt fastened. • Never drive with the airbags deployed. The fact that they hang out can impair the steering of your vehicle. Other safety systems can also be damaged. • The smoke and dust formed when the airbags are deployed can cause skin and eye irritation in the event of prolonged exposure. • Children must never be allowed in the front passenger's seat. • Occupants in the front passenger's seat must never sit on the edge of the seat, sit leaning toward the instrument panel or otherwise sit out of position. • The occupant's back must be as upright as comfort allows and be against the seat back with the seat belt properly fastened. • Feet must be on the floor, e.g., not on the dash, seat or out of the window. • No objects or accessory equipment, e.g. dashboard covers, may be placed on, attached to, or installed near the air bag hatch (the area above the glove compartment) or the area affected by airbag deployment. • There should be no loose articles, e.g. coffee cups, on the floor, seat, or dashboard area. • Never try to open the airbag cover on the steering wheel or the passenger's side dashboard. This should only be done by a trained and qualified Volvo service technician. Failure to follow these instructions can result in injury to the vehicle occupants.